The story all started back in 2011. My company that I created back in 1992 was operating smoothly until a major client came into my office and informed me of his plan to take his contract away from me as well as my right hand man of 18 years. Not only was this guy my right hand man, he was my best friend. This move created major pressure on me to not only perform the work of 2 men but also placed me under financial stress in an already struggling economy. That was a life changing moment. I spent the next three months trying to think of a different line of work, but after 30 years of surveying I could not find anything else that sounded appeasing. Still I needed something different, something that could push me and challenge my abilities. Also, the fact that I was now 51 years old and I had seen four of my friends pass during the last three years just made me want to break out and do something different. I have always loved the water. Owning two boats over the years, it just made sense to me to choose a river trip. I decided that my trip would take me down the Wabash into the Ohio, up the Cumberland, cross Lake Barkley, down the canal into Kentucky Lake, into the Tennessee River and back to the Ohio River. Once I was back in the Ohio I would then travel down river to Metropolis, Illinois exiting the river at this point. This route would be a 328 river mile trip. I needed a boat and a lot more information about the inland waterways. As I began to research the web and read several books, I came across three different authors that had a major impact on how I would pursue preparing for this trip. Mr. Jerry Hay, with his stories, books, and maps added to my addiction. Mr. Ray Macke, who created his own boat in which to travel many river miles and Mr. Tom Haynies using his pontoon boat he named “Free Bird”. His stories told of his Mississippi River trip. Now that I have realized this is what I would like to do, I just needed a boat and a plan with some luck or better yet, lots of luck. I have always liked taking trips but the two things that I enjoy the most about traveling are the planning and the coming back home. THE PLAN: I need a boat and I want a much larger boat then my current financial situation would allow. This is nothing new because I always like to dream big, than come back down to reality, it is just life. The right boat at the right price, but what is the right boat? I spent the next six months researching the many different styles of watercraft. I wanted a cabin cruiser style craft but they came to wide to easily pull down the roadway. Most of them come with two very large motors which would consume more fuel than I could afford. I liked the idea of the cabin cruiser, but it did not fit my budget. I than went to the other extreme and was looking at River Jons with a jet motor, less horse power but no propeller. The River Jon is great for a day on the river, but not for an extended river stay. Mr. Hay’s deck boat is very practical but lacks some of the human comforts that I would like. Mr. Haynies’ “Free Bird” boat made more since but lacked room and the boat sat very low in the water. After my six month search, the pontoon boats came out on top. However, some small changes would be necessary. A tri-toon pontoon boat would carry the weight and a longer length of around 22-25 feet would allow the room I felt I needed to spend multiple days on the water. However, the boat would have to be well used to be inside my budget. At the end of the 2011 boating season I found a 25 foot tri-toon pontoon boat made by Bennington with a 115 horsepower Yamaha motor. I now have the boat but it needs modified. A full canvas cover that if purchased would cost $3,000-$4,000, again outside my budget, but a cover would be a necessity to make my planned trip. During a family get-together, I was explaining to my bother-in-law Brad what I wanted. He suggested buying a cover and some one and a quarter inch square stock aluminum. If I purchased a metal bender, he would assist me in the framing of my new boat cover. The cost would run around $900, more than I had to spend. Within one week, a gentleman called my land surveying company asking if I would locate his property lines. When I ask for the address he gave me the name of a metal company. He received a great deal on his property survey and I received my square stock aluminum. Once the aluminum arrived at my house my bother-in-law and I went shopping for the much needed metal bender, tarps, and lots of other miscellaneous items to turn my tri-toon into a temporary house boat. During the fall Brad and I created the aluminum trusses and mounting brackets. The outside covers were made out of larger tarps which I cut down and placed eyelets around the outside edges. This would enable me to connect the tarps to the trusses. I also purchased netting which is used to cover the top of animal pens, to provide shade. By placing the netting along the longer outside walls it would reduce the sun and help detour the Asian Carp from entering the boat. The tarp coverings can be rolled up during the day to create an open boat feeling and then dropped down at night to create one very large room. The side tarp bottoms have PVC pipe added to them which allows them to be rolled up and add weight. In addition, 3 feet from the bottom we tied a rope along the side of the boat to help hold the tarps in place during high winds. The transformation came to a complete stop during the winter months. For Christmas my wife asked what kind of gifts I wanted. Of course, my want list consisted of items for my planned adventure such as a porta-pot, solar shower bags, compass, spotlight, and many other miscellaneous items. The boat already had a changing room which I planned on transforming into a bathroom. I felt a porta-pot was a perfect gift, one that can be used over and over. Brad and I worked on weekends for about a month before we finished the trusses and covering the boat with tarps. Lights were added as well as a GPS system. Being a land surveyor, I like to say I may not know exactly where we are, but I am not lost as I do know coordinates which always tell me where the boat is located at all times. Additional items added included another depth gauge, a back bracket for a trolling motor (which was later replaced with a 4 horse outboard) a VHF radio system, two solar panels needed to charge the double batteries on the boat, and two bull rings to hold up the solar shower bags. Throughout the boat’s transformation the family is all talking about my river trip and questioning my sanity. I receive a call from my wife’s second cousin Mike. He has heard the rumors of my upcoming adventure and not possessing any more common sense then myself, asked if there is anything he can do to help make this trip a reality. Mike is actually very interested in my planned river trip. He talks about the time he tried to get a small group together and make a similar run down to New Orleans but the plan never came to pass. Our conversation lasted about 20 minutes. I thanked him for showing interest and appreciation for what I planned to attempt and I went on about my day. The next week I started thinking about Mike’s enthusiasm and enviousness of my trip. The fact was I wanted another person to accompany me on this journey. Brad had no interest in making the trip, fixing the boat yes, but making a 10 day river run, no. So two weeks after our initial conversation I called Mike and ask him to make the run with me. Needless to say, he jumped at the opportunity. Now Mike is a retired railroad worker. He has spent many years working in Labor Management railroad safety program, a little fact that I did not know but soon found out. This is not a bad thing by all means, but I did not realized how many rules and regulations would come into play for this 10 day trip on the inland waterways. At this point the one thing I can tell you is that we are going to look good as well as comply with all the safety and boating regulations on this voyage. A priority was to color code the auxiliary fuel tank and make sure it had both a check valve and ground wire. All of this is good but I had not thought of all the safety issues that would come into play. It is great to have Mike onboard. I feel safer already. I needed someone to help with running the equipment and keeping an eye out for debris that could snag the boat. Plus just having someone to talk with along the way would be great and help keep me from losing what little sanity I currently have. The winter came and went. Spring 2012 came early with days in March having temperatures ranging in the 70’s and 80’s, not normal here in Indiana. I had planned on making the shakedown cruise in April and making the river trip in May. With the 80 degree weather, and the fact that I have been working on and planning this trip for almost a full year, I just had to make the run in March. With all the planning and work that I had done on the boat it still was not complete but it was close enough for a test run. Like a child in a candy store I could not wait any longer, I just had to make the test run. The river was at the correct depth, the air temperature was in the low 80’s and my river companion was as ready as I was. 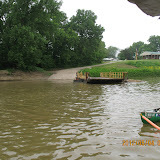 We decided to launch on the Wabash from Fairbanks Park in Terre Haute around noon on a Saturday and travel up river to Clinton which is about 15 miles. The plan to go upriver may not make sense with gas being over $4 per gallon but the ideal ology is based on if things go wrong we can float down river to where we left the truck and trailer. Like I said, I love to plan. However, the plan only goes so far and at this point we had to experience the trip, good or bad, it is all part of the adventure that make this river run exciting to me. Saturday morning finally arrives and I find myself trying to get the boat loaded and on the road to Terre Haute. I need about one hour to make the trip to Terre Haute. At noon I am still working on getting it all together. This did not set well with me because I do not like to be late. The plan was to have the boat on the river by 1:00 p.m. No way was I going to make the schedule. I went into the house and asked my wife if she would help pack the coolers with food and an overnight bag for me. She looked at me and said “since you are asking I guess I will”. Great! Now I can at least get out of the driveway by 1:00. Kim brings out the coolers and overnight bag and I am ready to go, or not! An old habit that my father instilled in me was to always make one last check by walking around anything that you are about to pull, check the locks and chains, making sure it is all properly connected, that is when I see my next obstacle that I will need to address before I depart on my shakedown trip. I have a flat tire on the boat trailer. Now I will definitely be late, but no problem. I have changed many tires throughout the years. I am at home where all my tools are available. I could be on the road with traffic zipping by with not enough room to get completely out of the way. There is still plenty of daylight and this is just the shakedown trip after all. I go back into my garage and get the hydraulic jack and tee bar. I start backing off the lug nuts only to find out that two of the nuts were not going to come off easily. By this time Mike calls on the phone and asks where I was at. Now understand, I am experiencing a high level of anxiety because of being late and I am going to be later as the two lug nuts were winning and I was losing so now was definitely not a good time to be calling me and asking where I am at. After a few sharp curse words and explaining the situation to Mike, he asked if I wanted him to drive to Linton and help. I told him no I would get this problem resolved just give me more time to work it out. One hour later I had the lug nuts off and was replacing the tire. This will prove later to be a down fall of mine to a great shakedown trip. Just remember if you cannot laugh at yourself then you are taking life way to serious, life is short - live, laugh and love. Be adventurous, make mistakes and learn from them always moving forward. It is like the old saying goes “People do not plan to fail, they fail to plan”. I finally arrived at the boat ramp around 3:00 p.m. and Mike is there waiting. I had called him 30 minutes out from my destination and asked if he would bring me a sandwich. I had missed lunch and needed some food before we start this trip. Mike and I spend the next hour loading the boat with our miscellaneous items we felt were necessary and rolling out the tarps. If I had left the tarps in place, the road trip would have ripped them off; therefore I had rolled them into small tubes and tied them up with rope. Now the front of the boat, also known as the bow, will have two 30 gallon containers, one filled with fuel and the other with water. We did not have the tanks completely up to safety code at this point, so I had placed two other tanks on the bow and filled them both with water to simulate the weight that would affect the boat during the actual trip. The plan is to carry 29 gallons of fuel in the main tank, an additional 30 gallons in the bow tank and one 5 gallon can which would give us a total of 64 gallons. The trip should take around 72 gallons and we have plans of stopping along the way and walking into town to replenish our supply. You have to understand that the Wabash River is not a true commercial river thereby we do not have any place on the river to get fuel; walk and carry would be the plan. Besides we will be needing ice along the way. We have converted a hunting carrier so the weight will not seem overbearing for us two middle-aged men on their dream adventure. The other 30 gallon tank will be used for water. We also will be carrying 10 gallons of water in the back to give us a total of 40 gallons to back the 10 day trip. My plan is to help balance the boat by placing around 480 lbs. on the front to offset the rear weight where most of the cargo will be stored and the main gas tank holding around 232 lbs. of fuel. I backed the boat trailer down the ramp and into the Wabash River only to find that the bow of the boat is too heavy and the water depth is not picking up the front of the boat. This is just a small problem. Once I get the boat out into the river, it will float and by the time it is ready to load the boat onto the trailer, both tanks will be empty, solving the weight problem. After three tries we finally get the boat to float. Mike takes the truck and trailer up to the parking lot and walks back down to the dock. It is now 4:00 pm and we are finally on our way. The Wabash was carrying around 5.5 feet of water this day so looking for the main channel was not going to be an issue. On the other hand seeing any sandbars was not going to happen - I like to see the sandbars. The jump off point is at Terre Haute City Park just south of US 40 at river mile 301 and we plan to run up-river to Clinton at river mile 284, about 17 river miles. Mike wanted to check out an old river hole he remembered being along the left bank, looking downstream, under the old railroad bridge. We spent a few minutes looking but were unable to find the hole. The water depth was running 10 to 20 feet. I told him he was getting to old to remember all the river details. The river is casually changing. However, on the way back I was running along the right bank and found the location. The depth finder called out 70 foot depth of water. I had the alarm set at 50 feet. From there we passed the remains of Fort Harrison at river mile 296. The remains are still there today but look like they may be going to disappear in the future. Another mile upstream we crossed the old power plant that still operates today. Three of the water pipes were running full power as we approached the site. The Asian carp were jumping everywhere as the boat traveled through this section of river. The screening that I had placed along both sides of the boat to help keep them out was working but mostly the carp was just hitting the sides of the boat. A few jumped up beside the me, making me almost jump out of my skin. I was not prepared for them to be as large and appear out of nowhere. From there we passed Coal Creek and Salt Creek near river mile 293 on the right hand side of the river and Otter Creek at river mile 291 on the left hand side. All three spots had Jon boats fishing the entry points. It is always good to see people out on the river enjoying the day and spending quality time together. At river mile 291 we could see Staff Island which at this time had been divided into two small islands. We passed by on the left side with no problem. We ran upriver until about 6:30 around river mile 286 and decide to stop for the night. I found a nice long straight part of the river and placed two anchors into the water. This location was perfect. We were across from a bald eagle nest, the boat was looking upstream toward the north so the sunset would be on our left and the sunrise the next morning would be on our right. The river looks great and the river corridor starts to come alive with wildlife as the sun begins to set. As I said, perfect but this overnight stay does not come with room service or TV; just complete quiet, Mother Nature at her best – perfect! Mike and I got the tarp covering put in place for the night and I fired up the gas grill and started cooking some hamburgers and brats. Mike got the potato salad and ice tea out of the coolers and supper was served. Mike finished up doing the dishes as I got the boat ready for our first overnight stay. A small rain shower moved in and I really enjoyed the sound of the rain hitting the top of the tarps on the boat. The wind created a little more noise, as it moved the tarps around but this all passed as the night wore on. Around 11 p.m. the woods became silent and all was heard was the river running between the toons of the boat. It was like sleeping beside a small waterfall and each time you woke-up from your sleep you thought you had to go to the bathroom. It can make for a long night but I told Mike that after two or three nights of this I am sure that this to will pass. The next morning we are up before sunrise and the air temperate is around 55 degrees. I fire up the LP gas heater and in just a few minutes the cold does not seem as cold. This works well until it is time to cook breakfast, sausage and eggs this morning is the plan. I had placed a 1500 watt inverter in the boat so that I would be able to cook breakfast on an electric griddle and make coffee. The coffee pot worked well but the griddle was pulling too much power for the inverter. I turned the griddle off and then opened up the area for the grill. Most of the heat rapidly leaves the cabin. Still breakfast was good and the location, in my mind was priceless! The rear of the boat was fully open providing a magnificent view. The river possesses a very calming effect as the sun first crosses over the water, with steam coming from the river and light dancing off of the water top. After breakfast the dishes were washed and put away. We proceeded to raise the side covering and take in the view. It was very pretty, but as I look over to my right to see the eagle nest, I could not find it anywhere. I ask Mike if he remembered the nest from the night before or had I just dreamed about it during the night. Mike said yes it is right there and he pointed toward where I was looking, but it was not there. Mike got into his overnight bag to get the binoculars and after looking for a few minutes he looked at me and said, “It was right there”. The next step would be to get the two anchors out of the water and make the rest of the run up to Clinton. The left anchor released but the right anchor had not locked into place. Then I knew, we had drifted downstream almost a quarter of a mile during the night. I was so glad that we did not hit anything. I had chosen the Wabash River for this test run as it is not heavily trafficked which would be to my benefit should we experience any snafus’, like this one. All is good, luck is on my side. Life is good and the test run continues. We travel upriver past Clinton before we turn around to make the run back to the boat ramp at Fairbanks Park. Before we start back, I empty the two front tanks which will allow the boat to weight 480 lbs. less in the bow. I carried the weight just for the test run and now I know the bow will be about four inches lower than I had planned but still doable. The trip upriver we had run 3000 rpms being about 8 to 9 miles per hour. The trip downriver was going to be done at 1000 rpms running about 5 to 6 miles per hour. The objective of this river trip is not to get from point A to point B in a short amount of time but to run with the river, slightly faster than the current to make the steering work. The boat’s motor runs very quietly. When planning this trip, I did not want to hear a big gas motor run but wanted to enjoy the river for what it is during the times between the low and high water stages. You have to understand this trip is not for the kids and people that think they have to be plugged into the Worldwide Web or have cell phone connection. I thoroughly love it, but it is not for everyone. Mike and I take several pictures along the way back. We pass a couple of other boaters that are focused on getting to some other place in the least amount of time as possible, as I said not the objective of this trip. Around 1:30 in the afternoon I decide it is lunchtime. Kim had packed cold cuts which were sounding pretty good. I was driving the boat and we were moving petty slow so I just shut off the motor and went to the front of the boat and tossed out one anchor. This was another mistake. I thought it would be neat to have the boat turn around using the anchor and rope to make the 180 degree turn, which did happen. We set in the middle of the river and had cold cuts, ice tea, and potato chips. The river had no traffic and the sun was warm, a nice place just to make a quick stop. After lunch I sent Mike up to the front of the boat to retrieve the anchor, this would be one more obstacle on the shakedown trip. The anchor was not going to come back up. At first I thought Mike was just trying to see if I would get excited but after trying to bring the anchor up myself it was definitely caught on something under the boat and maybe even stuck to the bottom of the river. The first thing we checked was the prop, no rope which was good, but the anchor still was not coming up. I leaned over the bow and saw the rope was hung up on the front depth gauge. Now I have a choice to make, get into the river and try to free the line or cut the line and float down river to clear it with the prop. Long story short I cut the line. Mike did not think we were drifting but we were. I could tell by the bank on the west side of the river but Mike was looking at the east bank and he did not see any movement. After about five minutes we were past any rope so I started up the motor and we proceeded downstream arriving at the ramp around 6:30 p.m. I sent Mike up to the truck to back the trailer down the ramp. I would pull the boat onto the trailer. Now this all sounds good but I have only loaded this boat twice and both times I found myself in the water along the ramp to get the boat centered on the trailer. Also, both of these times were in lake water with no river current pushing the craft downriver all the time. This will be a first and I did not plan on this being easy, where is the fun in that! The first time Mike backed the trailer up straight into the water which would work great in a lake situation without any current but that is not this. Next I had Mike back the trailer at a 45 degree angle across the ramp but in the water which would allow me to run against the current and try to get onto the trailer. I got close but could not hold the location due to the current. I tossed Mike a line and he tied the winch belt on to the line and I then was able to connect the belt to the front of the boat. Mike wound up the wench and the boat went right into place, using the motor to help hold the line over the trailer. You have to understand the trailer is totally under the water and the river water is full of mud. When we pulled the boat out of the water we were very pleased with ourselves. The boat is loaded and all we need to do now is unload the cargo and roll-up the tarps. As I pull the truck and trailer up the ramp Mike yells “STOP”. I stop and get out too see what is wrong. Mike motioned me back to the tire that I had replaced the day before and said “look at that, your rim is shot and one of the lug nuts is gone”. We decided to go ahead and unload the cargo from the boat, like we really had a choice. But before we had the boat unloaded we both noticed that the boat was not square on the trailer but off to the side by five inched. We cannot be moving the boat down the road unless the boat is lined up with the runners on the trailer. We had the boat correct at one point but before we were able to get the trailer out of the water, the river had pushed the rear of the boat off the runners pulling it downstream. Mike and I talk about the options: what are we going to do about the boat trailer problem, what about the tire rim problem? I explained to Mike that we had to take this one problem at a time and let’s just fix the boat on the trailer first as it looked like the easier one of the two to fix to me. We talked about backing back into the river and starting over. Mike suggested just putting the boat and trailer back into the river as deep as possible and he would use the motor to push the boat over, which he did; about six inches to far on the other side which was obvious only after I moved the boat and trailer up out of the water where we could see the boat trailer. We again started over for the third time but this time was a charm. The boat trailer became a perfect fit or within an inch or two, but close enough as our real problem is just beginning. We still have a trailer tire problem and I used the spare tire and rim the day before. This is Sunday and it is after 5:00, nothing is open. As Mike and I analyzed the situation it did not look good. The lug bolts would not lock into the hub; one lug nut was missing; two lug nuts were a quarter of an inch backed out from being tight; and we could not get them any tighter because the lug bolts were not attached to the hub. Yes, things were looking bad. On the up side, Mike only lives about five miles from the ramp. If we could just get to his garage we could leave the boat and trailer there. I could come back on Monday and take it apart to find out what had happened. We first drove Mike’s truck on the route we would use to limp our wounded trailer home for repairs. After we chose the route, we got a yellow strobe light and placed it on the top of the Mike’s truck cab. The plan was to drive very slowly toward Mike’s house. Mike would follow with his truck and flashing lights on. I would not be able to travel more than 5 to 10 miles per hour or I would definitely throw the rim off of the hub. As I started driving if I would get up to 8 to 9 miles per hour the hub would make a loud noise telling me to slow down or lose the wheel. I think I spent almost a full hour driving as if I were in a long parade route. We finally arrive at Mike’s and my nerves are totally shot. I dropped the boat trailer and told Mike bye and headed home to Linton. To make the trip down the Wabash River the water level needs to be between 5 to 9 feet at Terre Haute, Indiana and stay up for around three days. Once I am in the Ohio the water level will not be a deal breaker. The Wabash water level came up May 1st. I scheduled the trip for a departure of 1:00 P.M. on May 3rd. My plan was to run the rivers until May 12th. I spent most of Wednesday working with Mike to finish the boat and pack all the gear. The plan was to arrive back at Mike’s around 9:00 A.M. on Thursday morning. We would need to break the boat down, load the canoe, and be on the Wabash by 1:00 at the latest but like most of my best laid out plans this did not happen. When I arrived at Mike’s he was still working on putting bumper pads around the canoe; he had not pack anything: cloths, cooler, drinks, etc. We finally arrived at the Port of Terre Haute around 2:30 and it was 4:30 before we were pulling away from the dock. It takes around one and half hours just to re-assemble the boat and get all the supplies on board. During the time we were preparing the boat to launch, a gentleman by the name of Brendan Kearns stopped and asked us where we were going to travel to. So since the opportunity presented itself, I shared my master plan for the trip with him: the first leg will be to run the Wabash River from Terre Haute to the Ohio traveling about 186 miles then turn south and run the Ohio River for 72 miles to the Cumberland, travel up the Cumberland River for 31 miles to Lake Barkley, run across Lake Barkley to the canal into Kentucky Lake then run south to the Tennessee River and run it back to the Ohio; once back into the Ohio continue running south down to Metropolis Illinois and have a truck pick us up and bring us back home. The total run should be around 370 miles and we should be able to complete the trip within 10 days. The plan is to run around 2500 RPM which should create a speed of between 6 to 8 MPH, using around 75 gallons of fuel. I explained that one of the hard parts of this trip was just getting the boat off of the trailer and into the river because I had the bow of the boat loaded with 30 gallons of gas and 30 gallons of water, adding around 480 lbs. of weight to the front of the boat. Mr. Kearns said that he would stay around with his boat so if we needed any help he would use his boat to pull my boat off of the trailer. 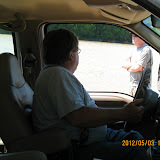 When we backed the boat into the Wabash River the boat came off the trailer with no problem. By this time Channel 10 News is at the dock to make a trip with Mr. Kearns up the Wabash and they start asking questions about my trip. After all of this is said and done Mike and I are off at 4:30 running around 6 MPH. We cover 23 miles and set anchor near Darwin Ferry. With it being so late I decided to heat-up some vegetable soup that my mother-in-law had made me for the trip. I did not want to stop to cook so I had Mike drive the boat and I used the electric skillet to heat up the soup. The inverter is located at the back of the boat near the floor which requires me to place the skillet on the floor. I sat down on the floor and started cooking and then it happened, a 20 lb. carp came up between the screen and the side of the boat, jumped over the gas grill and landed within 12 inches of my skillet. I started yelling at Mike and he shut down the motor. He started kicking that carp toward the back of the boat. He got the back door open and sent the carp on its way. After the carp was removed from the boat I noticed that the floor was now covered in blood. Carp seem to bleed a lot after hitting their head against a boat. But luckily our evening meal was still in the electric skillet. We set the anchor on the back side of an island. Just when we thought we might have a good night’s rest, the carp started jumping and hitting the sides of the boat. This lasted for quite some time but once the jumping stopped we were able to get a good night’s sleep. Day 1 was over and the real trip will start tomorrow with a full day of running the river. During the trip we will catch two carp, one in the boat and another in the canoe, the picture is the smaller one that landed in the canoe. We get up and I fix some eggs, bacon and coffee for breakfast. We are running by 7:30. The weather will bring two rain showers during the day, the first is no problem we just break-out the rain gear and keep on moving down river. However, the second was not just a shower but a full blown down pour that you could not see more than 200 feet in front of the boat with wind that stopped the boat from moving. I had to place the boat perpendicular to the river channel so that the wind was blowing against the side of the boat. By using the motor I was able to keep the boat in the channel. This storm only lasted about 30 minutes before I could see enough to drive the boat down river. This section of river has a lot of commercial fishing and in some places just getting between all the trap markers is challenging. The area is very remote and we only see one other boat all day. I was planning on stopping in Vincennes but I could not find a good place to anchor so we just keep on moving down river. The river in this section is very interesting and enjoyable. We traveled 67 miles that day and anchored in the Embarras River located at river mile 391. The evening meal was steak and potato chips with tea to drink. During the night another extreme rainstorm blew in and gave us another one inch of water but the boat covers worked and kept the rain out. I truly enjoyed that night, listening to the rain hit the boat covers. Start time was not until 8:45. The boat covers are wet and breakfast consisted of eggs and bacon, just a slow start but we are off and running. We will run around 7 MPH today and travel 51 river miles, anchoring 3 miles north of New Harmony. At this point we need to find fuel because New Harmony will be the last stop in Indiana to get fuel. The first marina on the Ohio River is Golconda, about 50 miles down the Ohio River. This section of river does not have the commercial fishing but since it is the weekend and the weather is good the sandbars become small cities with tents, boats, and four wheelers running everywhere. I planned on stopping at Graysville to get fuel but the old channel has grown up and there was no way to get back into the town by river. This section of river has the old lock and dam area but with the water level so high getting through was no problem. I anchor down on the back side of a large sandbar for the night but around 2 AM the anchor line and the front of the boat was hit by a large tree trunk which had to be removed before any damage was done to the boat or motor. Start time is 7:00 AM. We travel 3 miles down to New Harmony and go into town to get ice and 20 gallons of fuel. Since we only have 2 five gallon gas cans we will need to make two trips. For the first trip a gentleman with a red pick-up truck showed up at the boat ramp and offered to take Mike into town. After we loaded the 10 gallons of fuel and refilled the ice chests, another gentleman in a golf cart shows up at the ramp and offers to take Mike back into town for another 10 gallons of fuel. Mike took a side trip through New Harmony and said that he was going to bring his wife back down here to check the area out. Today we need to maneuver through several areas of questionable obstacles: a shallow area, another lock and dam, the Grand Chain of Rapids, and a collapsed abandoned railroad bridge. All of these areas are no problem since the water level is high. At this point the White River comes into the Wabash River and it doubles in size. I feel like I am in big water but I know big water is just ahead. We traveled through the cut at Big Island saving about six miles of river run. The lowest point was 8 feet deep with an average of 11 feet. During the time we were traveling through the cut I was able to see some large areas of the Big Island fall off into the Wabash River. It looked like the ice breaking off a glacier in which you would see on TV. The dirt was around 150 feet in length and it fell about four feet into the water. After the big cut we are at the edge of the Ohio River with the dam and lock just up river and barges in front of us waiting to go through the locks. We travel down river to Shawneetown and tried to anchor for the night but the water in the inlet was not moving and seemed stagnated so we traveled back upriver to Bell Island and anchored on the back side of it. We traveled 55 river miles today running between 6 to 8 MPH. The boat will run 32 mile per hour but it is not about getting to the end point, but it is all about the trip itself. Start time was 7:30 after we finished cleaning the morning dishes, sausage and egg sandwiches was our breakfast this morning. I would like to make a few miles before the rain comes in and we are forced to stop. We passed Cave in the Rock State Park just before noon. Let me tell you that the cave looks much larger as you stand on the river bank in front of it because from the water, I did not even know that it was the Cave in the Rock location and I was just there last year. As we passed the ferry and the Town of Cave in the Rock I decided that I must have missed the cave, oh well. The next stop will be E-Town River Restaurant, best floating restaurant in the area. Mike and I spent about an hour getting are fill of fresh fish and hushpuppies. I had told Mike that I would take him out to at least one restaurant during the trip and this was it. This trip was not about going out to different restaurants or stopping at different river towns. This trip is just true time spent on the river, eating meals on the river while enjoying the natural beauty of the river itself. That may be the reason my wife did not want to make this trip with me. After we finished having lunch we set off to make the run on down to Golconda Marina. This is located about 50 miles down river from the Wabash and will be the first place that we can buy fuel and ice on the water plus get a clean shower and shave. As I am pulling into the marina, I notice the sky is blackening down river about 5 miles. I tell Mike we should just go ahead and rent a boat slip for the night. The cost was only $18 and I was able to place the boat under roof. With the slip rental and the refueling our cost was $110 but remember fuel on the water is even more expensive than on land and we needed to fill both tanks. As I pulled the boat around and into the slip I forgot about the canoe and clipped the dock corner, breaking the hook off of the canoe. It took Mike about 20 minutes to fix it but all is well, the boat and canoe are both still afloat. As I drove around the docks we passed a two-story paddle wheeler, a very sharp looking pleasure craft. We spent some time talking to the owners, very interesting people. Sometimes the people you meet along the way make the trip totally enjoyable. They gave Mike a ride into town to get some more steaks and pork chops as we were starting to run low and this is great grilling food. Between the beauty of the river, the people along the way, and the absences of electronic devices this trip is as close to perfect as it gets. We traveled 46 river miles on this day. Today we will be going through our first lock and dam, Smithland Lock and Dam. As I approached the lock I radioed in to the Lock Master and he had the gate open when I arrived. We drove into the lock and passed through with no time delay and no problems. The Lock Master was very courteous and the staff came out to look the pleasure craft over. After locking through we turn north and started running up the Cumberland River. The channel is narrow and the bottom is rock or shale because you can not set anchor anywhere in the channel. The water is coming from Lake Barkley and since it is not running over any farm fields it is not carrying any dirt thereby the color is clear, a far cry different then the Wabash or the Ohio. We saw several stone or gravel plants along the right bank but we did not meet any barges and that was good, because the river channel is narrow. They would take up most of the channel in any of the curves. After running about 30 miles up river we get to the Barkley Lock and Dam. This Lock Master is not as friendly as the others and we have to wait about 2.5 hours to lock through. The Lock Master made us tie the rope to the boat which causes some minor damage to the boat when the current changed direction inside the lock. By the time I arrive in Lake Barkley the sun is well past setting and night was approaching fast. A strong wind just seemed to appear as we drove out into Lake Barkley. I had already picked out a place to stop for the night but getting there was going to be a challenge. I will need to travel across miles of open water with the wind cutting across the boat and several barges would need to be passed. I open the motor up but I could only get about 25 mph out of boat under the current conditions. We arrive at the selected location, only to find out that the water was to shallow for us to enter. New plan - travel up channel to the next inlet and stop if at all possible because the light is almost totally gone. I do not want to try to find another place in the dark. We traveled for about one mile and find an inlet but this location did not have a windbreak, oh well here we are and here is where I am going to drop anchor. When we got the first tarp up on the front of the boat the wind was cut down by more than 70 percent, boy did that make a big difference. Now we can get the rest of the tarps up and close this boat off for the night. Once the tarps were all in place the noise lowered and I thought the rain was moving in, great timing on our part but I was wrong, again. It was not rain but some type of flying bug that was hitting the tarps so hard it sounded like rain. We had thousands of these bugs inside and out of the boat. There will be no cooking tonight, to many bugs all over the place. Mike and I both put up our mosquito netting and had a beer for dinner. The next morning the wind and bugs have all gone and the lake looks silky. The air is cool but the lake surface is very smooth. My plan today is to run about 10 miles across Lake Barkley or up the Cumberland River both being the same and take a look at Buzzard Rock, then run on to Kentucky State Penitentiary, one of the most photographed spots on the Cumberland River. After reaching the points I turned the boat around and headed back. I should note that you can not just run across Lake Barkley you have to follow the channel markers because the water is very shallow and several islands exist just below the water line. Bottom line to get back is a 10 mile trip zigzagging across Lake Barkley to stay within the river channel. We run across the canal into Kentucky Lake and I turn toward the dam. I would like to make a stop at Grand Rivers KY but upon arrive we could not find anywhere to dock the boat. I turned the boat around again and started back across Kentucky Lake. This lake is very deep and several sail boats are busy enjoying the day. After running about 10 miles the wind picks back up and we are forced to seek shelter inside a bay, the water is white capping and my boat is not designed to run through that type of water. We spend the rest of the day just sitting back in the bay out of the wind and talking to the fisherman as they passed by. Since we had lots of time I fried up a big mess of potatoes, onions, and sausage for dinner. I wanted to get an early start so we leave the bay at the break of daylight and travel back up to Kentucky Lock and Dam. I radio the Lock Master and he tells us that they would be closed for the next 4 hours for maintenance work. I told him I would anchor down and wait. Since we have 4 hours I start making a big breakfast of ham steak and eggs. After breakfast we take a short nap and 8 hours later the lock is still not being used. A pusher boat captain comes over and informs us that the lock is only being used at night and the last two weeks the day shift is working on maintenance. Mike and I talk it over and we decide that I should not try to drive the Tennessee River at night. By this time we have two barges down river and three barges beside us all waiting to lock through. If I stay it would be some time in the middle of the night before this pleasure craft would be allowed to lock through. We start making our move around 5:00 P.M. I hustle the boat back around the canal and back to Barkley Lock and Dam and we run the Cumberland River back out to the Ohio but this time we are moving around 12 to 15 mph so that we can get to the Ohio before dark - we did not make it. However, we kept going until we got into the Ohio and found a place to anchor. This was going to be our last night so we decided to keep the covers off the boat and enjoy the stars and the light from the quarter moon. At night out away from any lights the sky can be very bright and pretty. We ran about 45 river miles today. Today is the last day and our pickup point is Paducah, Kentucky. The distance we need to travel is only 12 river miles. We make our way slowly because we know this is the end of a great river trip, one that I have been planning and putting together all of the past fall and winter. After we arrive at Paducah I make one last river breakfast, bacon and eggs. We watch the river boats pass on by wishing we could keep traveling but knowing I must go back to work. Total distance travel was 372 river miles, covering part of the Wabash, Ohio, Cumberland, and Tennessee Rivers. This was our target number to max out the fuel used. We used around 75 gallon of fuel but I did run the motor in the morning as I was making coffee to help cover the inverter pulling power from the batteries. The coffee was worth the cost, something about drinking coffee, out on the open water, as the sun rises in the morning, doesn’t get any better than that!! 24) Converted a deer carrier to an ice and gas cart. We were able to travel on four different rivers: Wabash, Ohio, Cumberland, and the Tennessee Rivers. The books all say that the Cumberland is the river to travel but I would have to disagree. I enjoyed the Wabash River the best because of the following: the remoteness; the commercial fishing on the northern half; the turn style bridges along the entire river - you just do not see that type of bridge anywhere else; the people truly enjoying the sandbars -not having to pay the government or a private campground owner for space; and the wildlife along the way. The Wabash was by far the best part of this river run. The second best part would be the people along the way. There is something truly great about people spending time along the river that are willing to help, if you ask. This is not like trying to hitchhike along the state roadway, just see how many people will actually stop and help; it is much different with a different type of people not afraid to help strangers. One old river rat along the way was explaining to me that the water level was going to be lower downstream, just thinking about it, he was correct. The third best part was the Ohio River. I just truly enjoyed running along the channel markers in this very wide river channel and the barges were even more fun to watch up close and personnel, than they are from the bank because they seem so far away. Lake Barkley and Kentucky Lake - I would rate at the bottom of the list. Too many people and too much open water. This trip was designed to run the rivers not the lakes. When we were on the lakes a national bass fishing tournament was taking place. The boats were top-of-the-line, with sponsor names like Snickers. They were traveling across the water at a very high rate of speed. Bottom line, I do not fish and how fast you can get from one place to another is not for me.